This is my third month participating in the Vegan Food Swap, organized by Cat at The Verdant Life. I have had so much fun participating these past few months. It’s so fun to go shopping for fun stuff and even more fun to get that yummy package in the mail. This month, I was chosen to receive a package from the amazing Adrienne over at Crack the Plates. I can’t get over how she just seemed to understand me in the package she sent over. Her box made me so happy. As I opened the box, the first thing I noticed was the amazing smell! She knew I loved spices and sent several. There were a bunch that I didn’t even have in my spice pantry! If you have seen my overstuffed spice cabinets, you would know it’s a huge accomplishment to get me something that I don’t have. She got me some sage, rosemary, poppy seeds, savory, caraway seeds, fennel seeds, apple pie spice blend and cinnamon sticks. She wasn’t done there though! 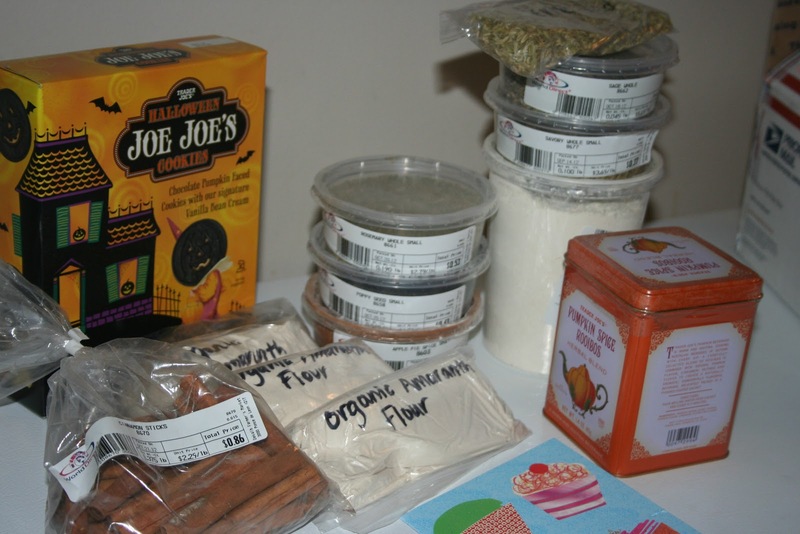 In addition to the amazing spices, there was quinoa and amaranth flour, some pumpkin spice rooibos tea and some amazing Halloween edition Trader Joe’s Joe Joe cookies! I really can’t wait to cook with the apple pie spice and the caraway seeds!